Surprise, surprise, surprise. I walked into this old building thinking I would find a few dirty post shores holding up a section of calapsing entryway or maybe even a portion of cieling that needed support but what I found was truly amazing. 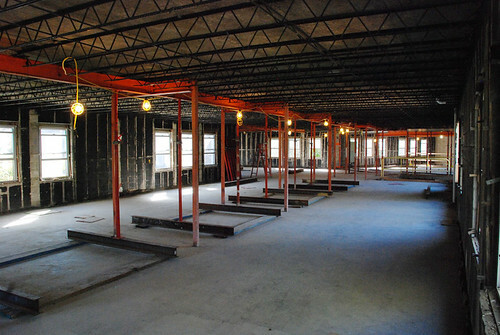 Now, shoring isn’t the most glamourus sector of the construction industry – relegated to dusty old basements and haunted houses deep in the underbellies where ghosts and spiders live… So this renovation at the Princeton Academy of the Sacred Heart at 1128 Great Road was a pleasant surprise. 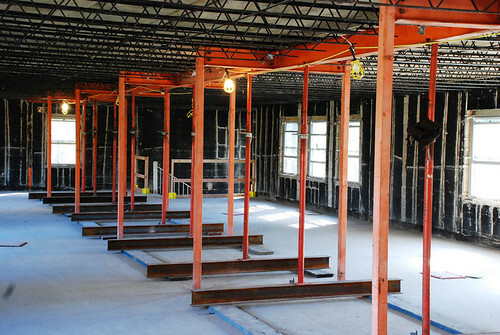 They are expanding this old structure in a big way, updating the old 4 story brick school building to a more open style learning environment. But to do that – they needed to take out most of their support walls and put new steel and concrete in to carry the weight. Normally, not a big deal because you do it one floor at at time. 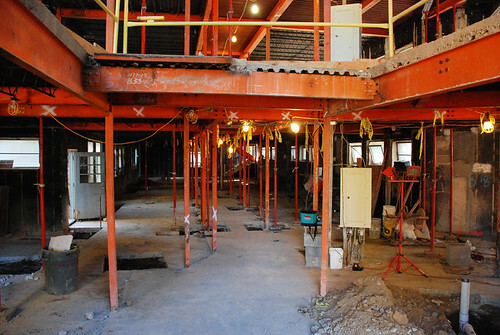 But this job was doing it ALL AT ONCE… Yes, 4 massive floors of concrete and steel being supported or shored up at once. 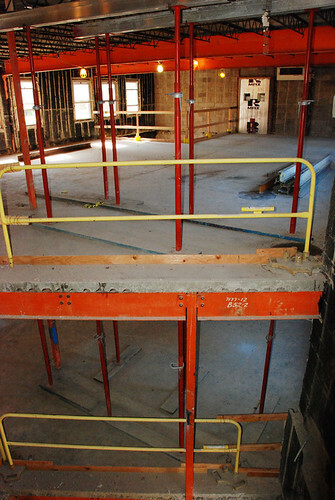 These old buildings once had many rooms and walls that would support the weight of the ceiling/floor above them. Take a look at these pictures and see just how incredible a task it was to support the floors above one another simultaneously. 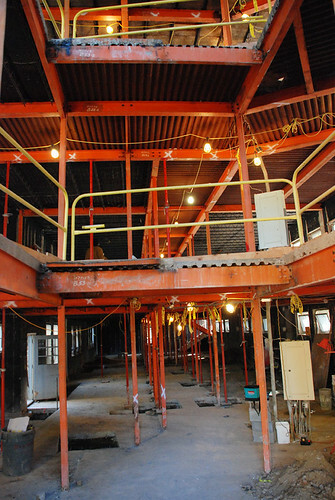 The really unique challenge here was that most projects like this work on one floor at a time as the new steel and concrete are added. 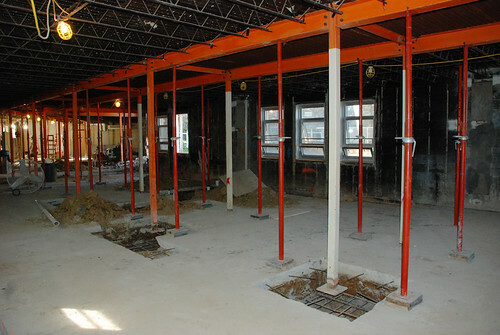 Once that structure is stable and in place you move to the next floor up the line. 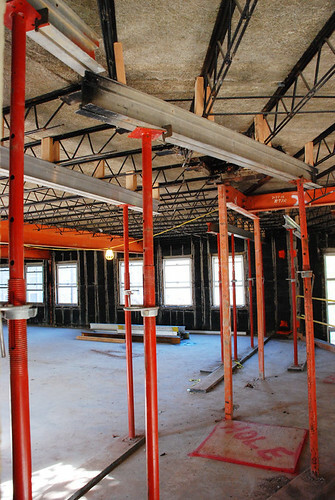 But with this project, Superior Scaffold engineer, Bob Robinson, had to design a shoring system that supported the existing steel and concrete for ALL 4 FLOORS AT ONCE! Crews could then modify and add the new steel and supports needed for the additional weight. You can see the bottom floor in the photographs. This was where the bulk of the support weight was being carried from the floors above it. 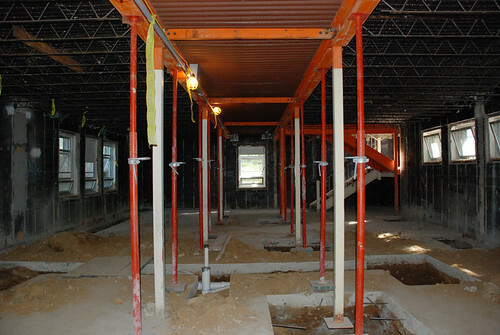 Robinson had to calculate the weight loads and provide the proper shoring equipment necessary to keep this project standing. 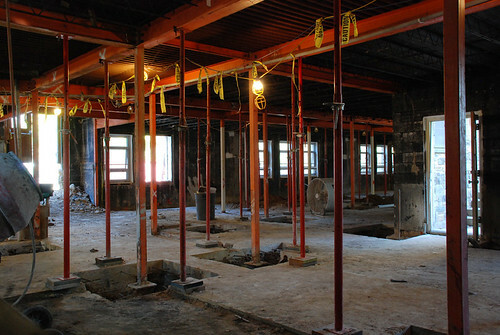 All of the architectural drawings had to be PE stamped in NJ before the project could begin. Currently, the bottom and the second floors are complete. 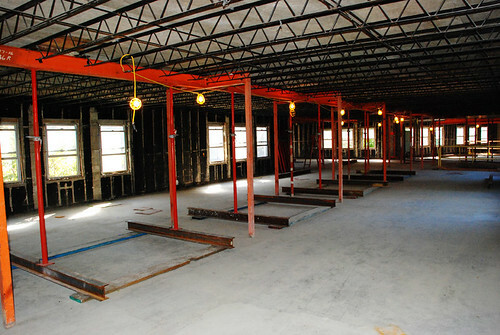 We will bring you updates and photos as the job gets closer to completion. Additional information on the school. 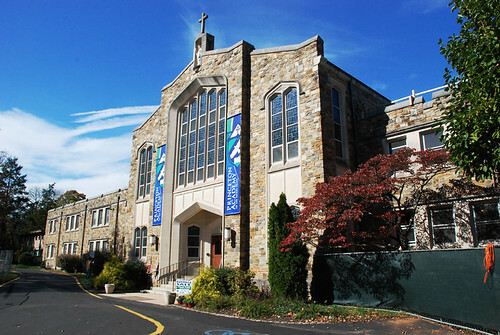 Princeton Academy of the Sacred Heart is an independent all-boys Catholic school located in Princeton, New Jersey and is part of the Sacred Heart Network of Schools. Princeton Academy serves students from Junior Kindergarten through grade 8 and is the only all-boys Catholic primary school in the state of New Jersey. The school operates within the Roman Catholic Diocese of Trenton. 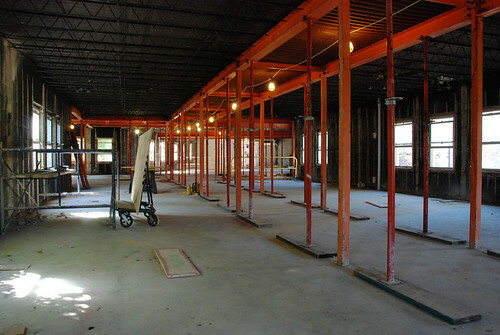 This entry was posted on Thursday, December 6th, 2012 at 1:21 pm	and is filed under News & Updates, Shoring. You can follow any responses to this entry through the RSS 2.0 feed. Both comments and pings are currently closed.